OUR OTHER CURRENTLY FEATURED BOOK, “INSIGHTS FROM INSIDE,” CAN BE FOUND BY SCROLLING DOWN JUST BELOW THIS POST. SUMMARY: Yossi Abulafia, an Israeli policeman, is on reserve army duty, and is photographing antelopes instead of watching the border. His post collapses suddenly, injuring him seriously. 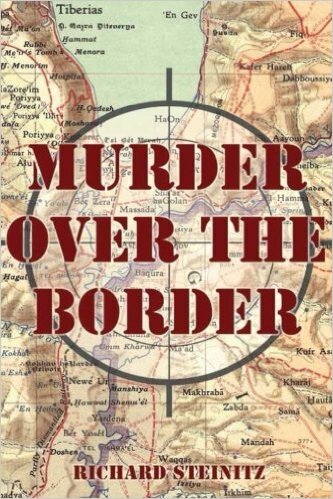 After recovering, he discovers that during the collapse he has unwittingly taken a picture of what appears to be a murder – on the other side of the border. As part of his duties he meets with the Palestinian delegation and discovers a connection to the shooter in Amsterdam, and to the murder in Jordan. A series of incidents, shootings and diplomatic activity eventually lead to the unexpected solving of the crimes. THE BACK STORY: I had the good fortune to do Reserve service one summer at a small outpost near the triangle border – the junction of Israel, Jordan and Syria, at the meeting of the Jordan and Yarmukh rivers. The physical location was beautiful, and nature stepped in with a band of gazelles that wandered around the base. They were small enough and light enough so that they didn’t set off the mines that were scattered outside the barbed-wire fencing, and so they could come very close to where we were. One of our jobs was to sit in a little bunker on the side of the hill, with a tin roof over our heads to keep the sun off, and a huge telescope inside it. The job was to watch the movement of Jordanian rmy vehicles, going up and down the road that parallels the border on the Jordanian side, and write down in a notebook every one that drove past. The job was boring, to say the least, since only half a dozen or so army vehicles drove down that road in a given day (and not many more civilian ones). The telescope was for us to be able to see whether they were military or civilian vehicles, and if possible, to identify the units they belonged to, by the flashes painted on them. So I spent a bit more time watching the gazelles than I probably should have, and really regretted not having a camera with me to photograph them. This combination of gazelles, telescope and boredom rattled around in my mind for a long, long time – probably five years or more. It seemed to me to be a great idea for a story of some kind, even though I had no experience in story-writing and no intentions of doing any writing. One day the seed germinated and I started to write – without any real plan or outline. It took me seven years to write what became Murder Over the Border, though I did do a few other things too. WHY SOMEONE WOULD WANT TO READ IT: Great murder mystery, with Middle Eastern flavor and full of surprises. 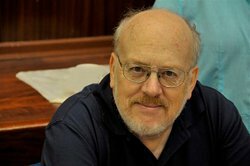 AUTHOR PROFILE: Born in New York City of German-Jewish immigrant parents, Richard Steinitz studied at the State University of NY at Buffalo, and has been living in Israel since 1968. When not writing novels, he reads them in great quantities, and works for a multi-national educational publisher. He and his wife Naomi are the parents of two grown children and have two grandchildren. Though his own parents escaped the Holocaust, it has had an enduring effect on his life, and his writing. Researching the background for his books is his favorite activity, after reading mysteries!